Ralph Waldo Emerson once said, “Life is a journey, not a destination.” When exploring a region’s culture and authenticity, the route one takes to an ending point is just as critical as the terminus itself. If anyone knows the truth in Emerson’s quote, it is Jim Johnson, who founded BikeTours.com. Johnson and BikeTours.com believe cycling is the ideal mode of travel when exploring multiple sites. The company is unlike other cycling companies; they are not a tour operator or a listing site. Representing more than 75 local bicycle touring companies across Europe, BikeTours.com doesn’t run the tours themselves but has established relationships with local operators to create the most genuine tours in the wide range of regions they visit. The organization’s inclusive philosophy runs through its tours as well as its employees. “BikeTours.com attracts free spirits, outdoor types, creative folks and people with wanderlust,” says Johnson. “Employees went from being one of my biggest concerns to being my extended family.” Almost 10 years ago the company began representing local businesses to run the bike tours which continually provide clients with the best value and experience of the land and culture through, “the eyes of the local,” which is still true today. Booking through local companies provides for the economy while the outstanding personal services continue to keep happy clients coming back to the environmentally friendly way of traveling. Pedal with us through these five bike routes traveling along Albania’s rivers, valleys and gorges, Portugal’s historic castles while sipping on local wine, Ireland’s coastal wilderness, Danube’s most loved bike path and along the Western Balkans’ Via Dinarica trail from Dubrovnik, Croatia, to Sarajevo, Bosnia and Herzegovina, to experience a journey outside of trains, planes and automobiles. Rivers, valleys and gorges. Oh, my! This UNESCO-guided tour starting in the mountainous Qafë Thanë region of Albania is a level-4 tour with steep and long climbs as clients gaze upon the beaches of the Albanian Riviera and snow-capped mountains—all while enjoying the region’s untouched culture with friendly locals. Activities include: climbing into the core of the Grammoz Mountains and exploring the cobbled alleys of Gjirokastër, the city of 1,000 steps. What sets this nine-night tour apart from others is the immense hospitality given from local villagers who welcome cyclists to their village and surrounding uncharted areas. And If traveling the path less traveled and ending in the city of Vlorë, Albania, isn’t enough, the expedition is a Gold Star Tour due to its expansive history. The area has been populated for over 4,000 years and its culture—along with friendly locals and services—reflect the depth of that heritage. The charming trails and villages of the Albania Riviera, warm beaches of the Bay of Himare and visiting Lake Ohrid, on the border of Macedonia is just a bonus to the country who has yet to be discovered by the mass tourism industry. Another Gold Star Tour will take cyclists through some of the most remote parts of Ireland’s west coast that Connemara has to offer. Explore the Wild Atlantic Way’s coastal route which is a level-3 self-guided tour. Known for its service, culture, scenery and charm the Wild Atlantic Way Cycling tour gives clients the most tranquil experience in one of the wildest of atmospheres. Start the journey at the capital of Connemara before heading to Clifden which is brimming with cozy pubs, restaurants, traditional music and culture. As travelers continue the tour, they will travel through fishing villages, deep valleys, rugged peninsulas and even take a trip to Inishbofin. In the fishing city of Cleggan, clients will take a ferry to the island of Inishbofin, populated with 200 inhabitants, which continues to maintain traditional ways of life. Cycling through the West Coast, visitors will see the historic Renvyle Peninsula, passing through Letterfrack, home of the Connemara National Park and bike through the Delphi Valley to Louisburgh. End the journey in the heritage town of Westport with its modern and traditional collaboration. While in Europe, wine is a must. When castles are involved, well then we are just getting fancy. This guided or self-guided cycling tour is a level-3, but clients will be able to enjoy local wine and cycle the next day. 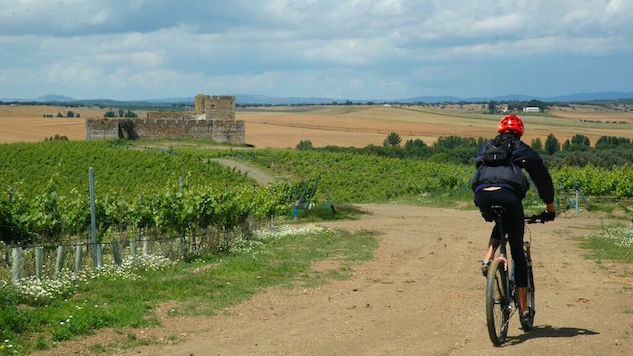 After beginning the tour in Arraiolos, clents will cycle through the Arraiolos village with its famous carpets and climb castles to experience one of the only round castles on the peninsula. Other adventures include visiting a cheese farm and riding through other modest farms until reaching the Aldeia da Terra which is a gigantic cartoon made of clay. After resting in farmhouses, palaces and castles during the night, olive groves, cork oaks, grazing lands and most importantly vineyards will be the scenic landscapes during the day. Wine brewed in clay pots and the region’s food is in a plus while also witnessing the fortified village of Monsaraz. Travelers will climb the marble Donjon tower of the castle where they will sleep like a princess or prince on the last night. Known as Europe’s best-known and most loved bike routes, explore the path along the Danube River on this self-guided level-1 tour. The tour begins in the city of three rivers, Passau, Germany, which travels through the town of Engelhartszell with its Trappist monastery and the Schlögener Schlinge. Cyclists will also travel to the Melk Abbey, a baroque structure built between 1702 and 1736 which sparked the official start of Wachau, Austria’s most famous wine-growing region. The seven-night tour offers a broad range of landscapes, historical sites, and cultural history. After taking a side-trip to St. Florian, the small Danube town dominated by the Augustinian Abbey and exploring the Krem, the 1,000-year old town full churches, fortifications and monasteries the tour ends in the capital and largest city in Austria, Vienna, which was designated as a UNESCO World Heritage site in 2001. Beginning in Dubrovnik, Croatia, and ending in Sarajevo, Bosnia and Herzegovina, a new bike tour, partnered with Bosnia-based tour operator Green Visions is currently in the works and is an outdoor enthusiasts dream with a ride into a historic past and diverse cultures. Both cities are beautiful and covered with the residue of epochs gone by—the Ottoman Empire, the Venetian Empire, Austro-Hungary, Yugoslavia—and thus have a densely complicated and fascinating history. The bike route is nearly 1,200 miles and roughly follows the sections of the Via Dinarica mega-hiking trail traveling through the countries of the Western Balkans: Slovenia, Croatia, Bosnia and Herzegovina, Montenegro, Albania, Kosovo and Macedonia. Soon cyclists will be able to experience glacial lakes, ancient towns, remote villages, the Adriatic coast and the Dinaric Alps.